What is the Federal Executive Board? By Presidential Directive in 1961, President John F. Kennedy established Federal Executive Boards (FEBs) to achieve better interagency coordination and communication among federal departments and activities outside of Washington, DC. The need for effective coordination among federal organization’s field activities was clear in 1961 and is even more important today. Approximately 88% of all federal employees work outside of the National Capital Area and most federal programs are implemented through regional and local offices of departments and agencies. FEBs provide a forum for local federal leaders to connect and discuss management challenges and strategies, enable collaboration on goals, common issues and special initiatives, as well as share best practices. There are 28 FEBs throughout the nation. Click here to view a location map. The Portland Federal Executive Board was established in 1969 and renamed the Oregon Federal Executive Board in 1998 as part of an effort to expand its service area. Over the years, thousands of federal employees have worked together to create better partnerships and a more effective federal government in our region. Mission Statement - Increase the effectiveness of Federal Government by strengthening coordination of Government activities. Increases emergency preparedness of the local federal community by serving as the hub for information sharing, planning and coordination. The Board of Directors governs the Oregon FEB by setting goals and priorities based upon the common interests and needs of local federal agencies. They establish direction for the coordination of programs among member agencies and monitor the performance of those programs in conjunction with the performance of the Oregon FEB staff. The Board of Directors also serves as a communications and networking forum member agency leaders - a place where executives build relationships with colleagues and strengthen partnerships with agencies. The Committee consists of 15-20 local federal agency directors or senior managers and meets quarterly. It is led by a Chair and Vice-Chair, who are elected annually and serve from Oct. 1 - Sept. 30. Reporting directly to the Board of Directors are Administrative Services, the Local Federal Coordinating Committee of the Combined Federal Campaign and the Emergency Preparedness (C3) Committee. The Alternative Dispute Resolution/Shared Neutrals Committee is a sub-group of Administrative Services. The Oregon FEB is currently staffed by the Executive Director, who is charged with carrying out the FEB's programs and supporting all committees. He reports to the Board of Directors and the Office of Personnel Management's Office of FEB Operations. 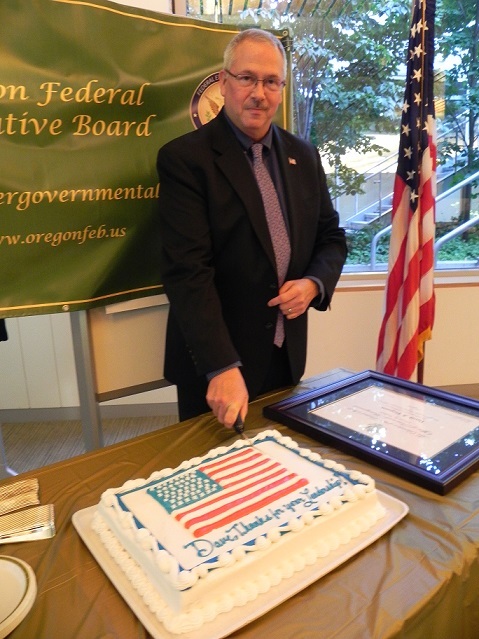 David Ferguson, departing 2017 Chair of the Oregon Federal Executive Board of Directors, cutting the "thank you, dave" cake following the swearing in of the 2018 chair, Jeninifer baker (SBA). Vice Chair, tina burke (tsa) was not present.